Enhance your school’s anti-bullying curriculum with this creative challenge and connection to the Common Core! 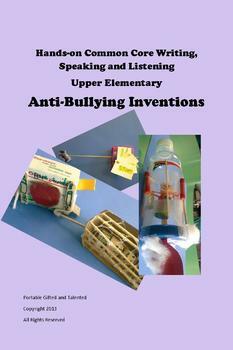 In this lesson, students create an anti-bully invention, elaborate with details and a clear focus, and then participate in a Common Core Speaking and Listening activity through a “kid-friendly” extemporaneous speech. With this lesson, students synthesize ideas and skills for success both inside the classroom and on the playground. Included are full explanations, samples, two activity sheets, Common Core Standards references, and additional tips, tricks, and justifications so any teacher is ready to “print and go” with this lesson. This lesson is good for full classes or gifted and talented groups—grades 3-7.